Sometimes, basic side-to-side rocking is just not enough to soothe an irritable baby. 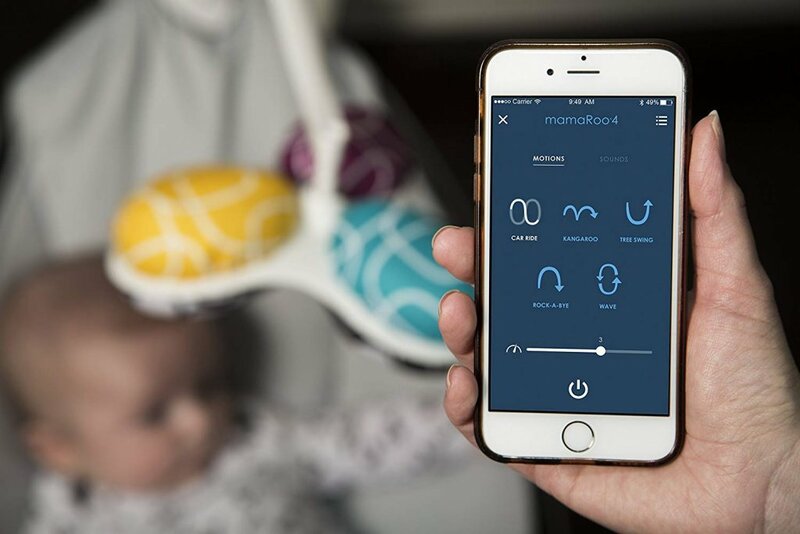 The designers of the mamaRoo Automatic Bluetooth Baby Swing certainly had this in mind and they came up with an automatic bouncer that features several unique swinging motions and speeds. Its purpose is to mimic the way you would move if you were to rock your baby in your arms. The swing moves up and down and sways from side to side just like you do when you are playing with your baby or trying to put them to sleep. Its Bluetooth feature allows you to control the swing right from your mobile device. 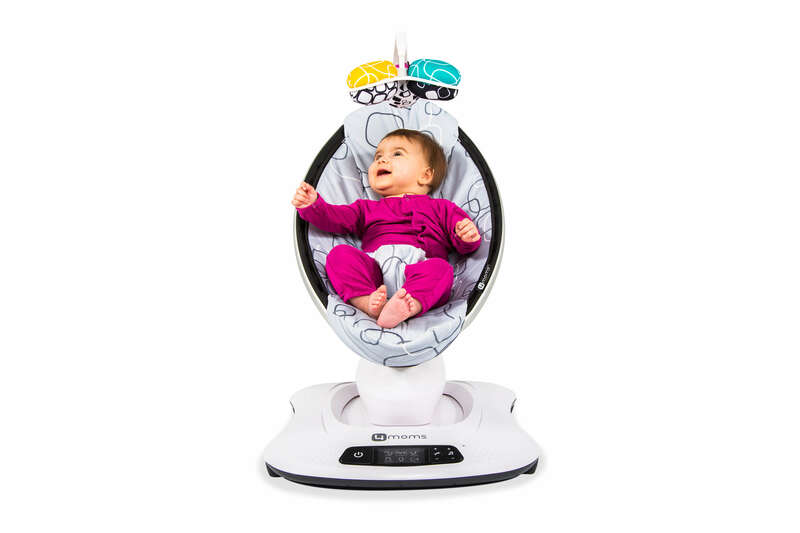 Apart from the Bluetooth functionality, the most distinct feature of the 4moms mamaRoo Automatic Bluetooth Baby Swing is its unique swinging modes. It features 5 unique motions and speeds suitable for several different scenarios. Check out our list of the best baby rockers & swings! 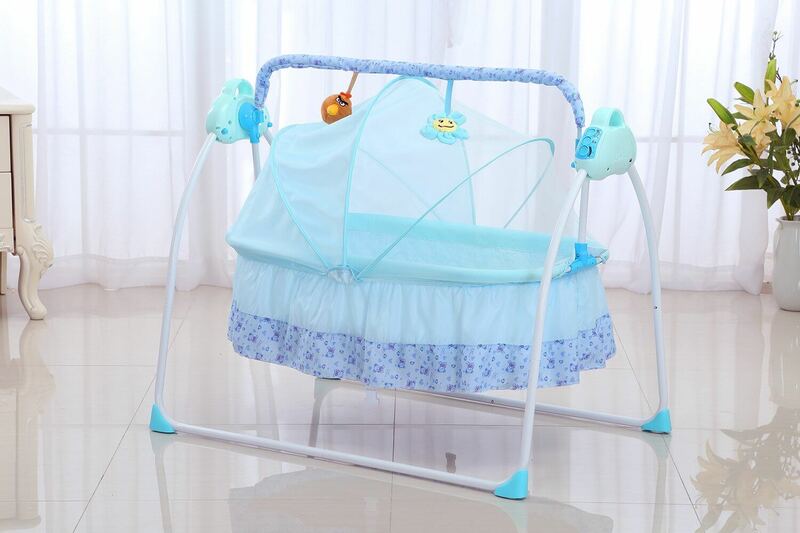 You can set the seat to bounce up and down which is great for when your baby is awake and playing, it can sway side to side to help put your child to sleep, and there are other variations of these movements in between. The movements of the swing can mimic that of a moving car, a gently bouncing kangaroo, and a tree swing, among others. Babies can easily get bored and they may get tired of being rocked in only one direction so it’s great to have all these options. It also features more speed settings than ordinary swings. Most automatic baby swings only feature up to 3 speeds but the mamaRoo offers 5 different speed settings. Instead of just slow, medium, and fast, you can set it to a more ideal speed which is oftentimes, in between. This baby swing offers maximum comfort and versatility with its adjustable seat recline feature. Your child can sit straight and unassisted in the upright seating mode when they want to play or eat. When it’s time to take a nap, the seat fully reclines so your baby can be in a flat lying position. You can also adjust the seat halfway which is ideal when they are feeding from a bottle. The seat cover is made of a smooth, woven nylon material which is gentle on your child’s skin so it won’t irritate them. It allows just enough air to flow through so your child won’t be too hot while in the swing. There is enough padding on all sides of the seat to support your baby’s delicate back, head, arms, and legs. The seat is removable and machine-washable so you can easily keep it germ-free at all times. The mamaRoo is equipped with a padded safety belt to keep your baby securely in place while in the swing. There is also an additional pair of straps that can be used for smaller babies. It has a wide sturdy flat base that keeps the swing stable even as the seat moves in different directions. This Bluetooth swing has 4 built-in sounds that you can play for your child but you also have the option to plug in your mp3 player and play your own music. You can even control the sounds directly from your smartphone or tablet when it’s paired via Bluetooth. It features a toy mobile with reversible toy balls hanging from the top of the seat to keep your baby entertained. One of the balls functions as a rattle, one is a crinkle ball, and the other has a mirror. These interactive toys encourage your baby’s curiosity and keep them engaged during play. Despite its many features, the 4moms mamaRoo Automatic Bluetooth Baby Swing features very simple operation. All the controls that you need are located on the base of the swing with large buttons that are easy to understand. You can turn the swing and off with the power button and beside it is a touchscreen panel where you can select from the 5 swinging modes. To the right are two toggle buttons which allow you to adjust the swing’s speed and music volume. Since the controls are located on the base of the swing, it is not always convenient to operate but you can use your phone to access the swing’s settings at any time. All you need to do is download the mobile app on your device and pair the swing with your device via bluetooth. Within the app, you can choose from the different swinging motions, set the speed, choose a sound, and turn the swing on or off. The 4moms app for iOS is compatible with all Apple devices newer than the iPhone 4s, running on iOS 9 or later. It is also compatible with Android devices that support bluetooth and are running on Android 4.3 or later. The 4moms mamaRoo Automatic Bluetooth Baby Swing is powered by an AC adaptor. No batteries required. This baby swing has a simple but elegant modern design. It is dominantly white with black accents. The neutral colors easily go well with any room decor. It’s compact so it’s great for those with limited spaces. 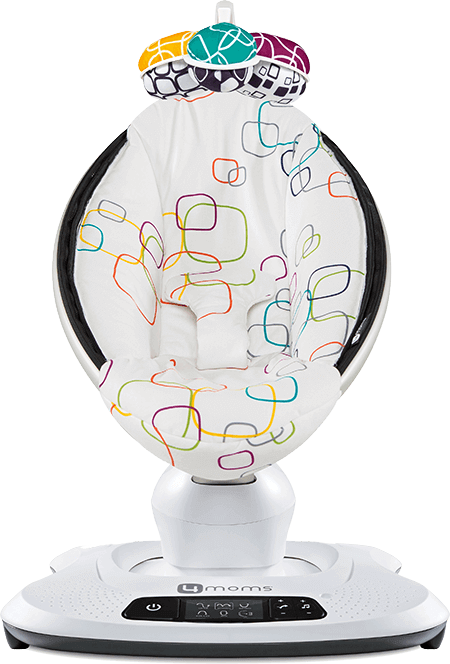 When it comes to innovative features, the 4moms mamaRoo Automatic Bluetooth Baby Swing is definitely one of the best. The variety of swinging motions available makes it so much more effective in calming and entertaining your baby. Most importantly, these swinging motions mimic real movements that babies often find soothing such as being inside a moving vehicle and being rocked in their parent’s arms. It is also very convenient to use especially since you can control and change the swing’s settings straight from your mobile device. It’s easy to see why many parents think that the mamaRoo baby swing is one of their most essential baby gears. How to Find the Best Flying Saucer Swing?